The suspect being sought for the stabbing of a man on a train in Surrey has been arrested, British Transport Police say. A 51-year-old man died after suffering multiple knife wounds during a "vicious fight" on board a Guildford to London train on Friday afternoon. He was killed in front of his 14-year-old son. 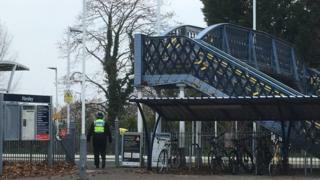 The victim and the attacker both got on the train at London Road station in Guildford at about 13:00 GMT. The suspect was detained at an address in the Farnham area at around 06:00 GMT on suspicion of murder. More than 40 officers from British Transport Police are working alongside Surrey Police and on Saturday morning the forces were still searching for the murder weapon between Horsley and Farnham. 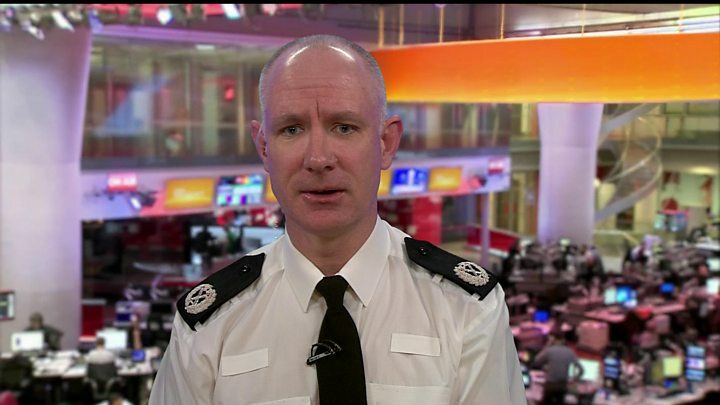 Assistant Chief Constable Sean O'Callaghan told BBC Breakfast: "I can confirm this morning that we have arrested who we believe to be the suspect in relation to this violent offence and also another person involved as well. "Those arrests have taken place in an address in the Surrey area this morning." Mr O'Callaghan described the sequence of events detectives know to have taken place on the train. He said: "We now know from enquiries we've been doing overnight and from witnesses that the two men were involved in a verbal discussion, that discussion lasted three to four minutes. "It moved through one carriage from where they first boarded into another carriage, and that argument escalated to the unprovoked violent attack that sadly resulted in the death." Mr O'Callaghan also said detectives are confident with the arrests they have made and no-one else was being sought in connection with the killing at this time. He said: "This is, as far as we can see at this moment in time, an incident that has occurred when two men have been talking to one another, opposed to a random attack on a train. "Travelling on the train is still an extremely safe thing to do. Very few crimes actually occur on the train itself. "In terms of violent offences, it's one violent offence for approximately one million passenger journeys, so the chances of being a victim of violence on a train in England, Scotland and Wales is still extremely low."